The Race Continues: We Find Jita! We are still on Principe and down to the hard corps: me, Wes and Josef. The mushroom and plant folks, Dennis, Brian, Tom and Rebecca are home in San Francisco by now. So it is time to tell you a little about my own research interests. Cobra Jita is a snake and we have been looking for it all week; in order to explain why, I need to tell you a frog story. 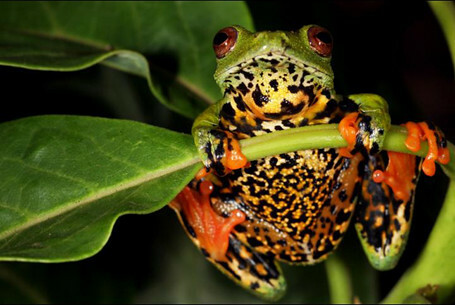 As I have said, the fact that there are amphibians here at all is astounding; amphibians, along with primary freshwater fish, are among the poorest dispersers across saltwater barriers known. They are the last kinds of critters one would expect to find on an oceanic island…. Think of the Hawaiian Islands and the Galapagos, perhaps the two most intensely studied oceanic archipelagos in the world… no frogs or other amphibians, right? But here on Sao Tome and Principe we have seven amphibian species, one of which is the famous caecilian, Schistometopum thomense. How can this be? How did they get here? More on this later, but one of the keys is time: remember that Sao Tome is at least 15 million years old, and Principe is more than double that, perhaps 31 million years. 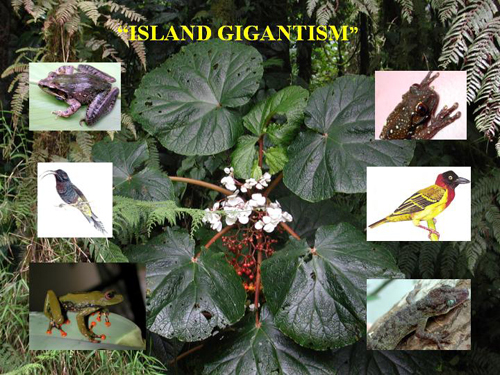 Hawaii and the Galapagos are but 5 million years max. 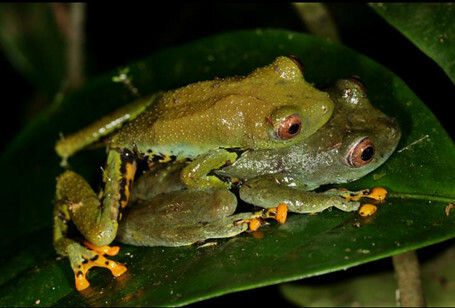 During GG I, we collected series of little brown frogs of the genus Phrynobatrachus from various locations on both islands; at the time all of them were considered the same species, P. dispar, originally described from Principe over 100 years ago. 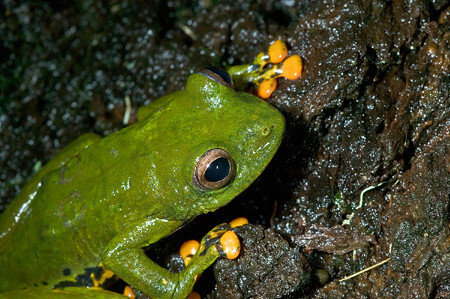 In 2005, a bright young intern from Willamette University named Josef Uyeda, spent the summer in my lab studying these preserved specimens and concluded that the frogs were quite different. Josef joined GG II and did a lot of collecting on both islands, recorded calls, did dissections and comparisons of DNA from the critters on both islands. 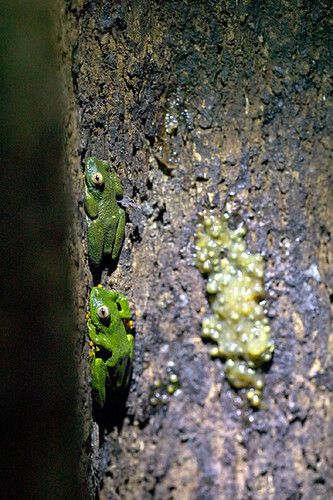 The results are that the two island frogs are VERY different; in fact, there is nearly 21% DNA sequence difference between the two; indicating that they have not interbred in many millions of years, possibly predating the existence of Sao Tome (yet they still look virtually identical!). Moreover the two together appear to be more closely related to East African species than to more nearby West African species, but more on that later. 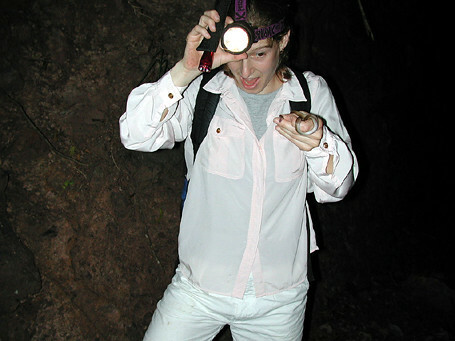 In 2007, Josef, I and Breda Zimkus of Harvard described the Sao Tome brown frogs as a new species, Phrynobatrachus leveleve. This brings me to cobra jita (pronounced “zheetah” – it means snake slow, as opposed to the other Principe snake, cobra sua sua, which means snake fast!). Here we have the same situation as we had with the small brown frogs, Phrynobatrachus. 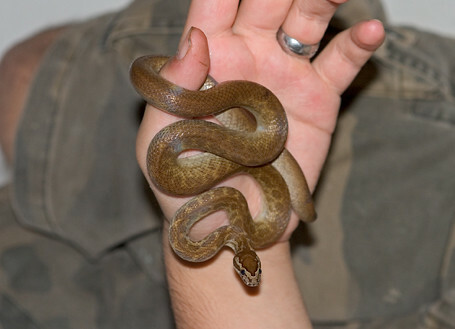 Jita (more properly known as Lamprophis lineatus bedriagae, or lined house snake) has always been considered to be the same species on both islands. After our frog studies, I am not so sure! They look different – regrettably I will have to post a picture of the Sao Tome form later… didn’t bring one in my zip drive—the Principe form is much more obviously patterned than the Sao Tome snake. During GG I and GG II we got very good samples of the Sao Tome population, but for some reason, only one specimen from Principe. Josef is now a PhD candidate at Oregon State University and joined us a couple of weeks ago in our search for Jita (among other things I will describe later). Snakes, as you probably know, are where you find them… as primary predators, they are never very common but always around, and such has been the case here on Principe. It has taken us six days of trekking around in the forest, turning over logs, etc. to find six snakes. But I am delighted. This is certainly enough now to estimate the genetic distance between the two populations, and given the age of these islands, I will not be surprised at all to learn that they are distinct at the species level. We have learned a lot about this critter. 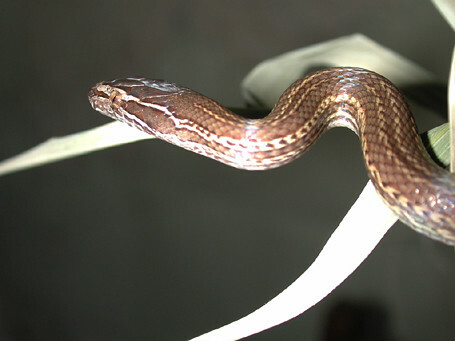 On Sao Tome, Jita is primarily nocturnal while the daylight hours on that island seem to be dominated by the endemic Sao Tome green bush snake, Philothamnus thomensis. This is the situation we would predict using island biogeographic theory—no niche overlap – they both seem to eat frogs and skinks, but at different times. But here on Principe, all of the jitas we have caught have been during the daylight hours, as was the single individual caught during GG II in 2006. Moreover, the green snake of Principe (yes there is a green sua sua here as well, but not related to the Sao Tome species) also seems to be diurnal! They are incredibly fast; we have seen two of them and missed both. So until we can look at stomach contents, we seem to have an ecological mystery. Our search has been greatly aided by an amazingly bright local naturalist; Jose Ramos Maria Vital Pires, or Ramos for short. Ramos has led us around this island searching for the elusive jita we have been blown away by his keen perception and observations of the local flora and fauna, and his delightful smile and sense of humor. The thing is everyone knows about this snake, most of the locals are to say the least, not exactly fond of snakes and one referred to as a “house snake” frequently comes a little too close for comfort, as you might imagine. But finding a snake when you are looking for it is entirely different matter. Our first success occurred on Bom Bom Island (not really and island, but sort of). I had just commented that the area Ramos was leading us through was too steep to find a snake, when he began excitedly shouting “snake!” only meters away. Within moments we had bagged our first jita. There have been some rather ignominious moments for me personally. My two young compadres, Wes and Josef are willing to give me credit for catching but one jita, a dead one. The specimen had, in fact, been killed two hours earlier by a local woman who was delighted to have us remove it from along the road. This morning was the last straw. We had been combing Bom Bom Island again; Josef and Wes had taken a lower route than I and about an hour in, I heard Josef yell that they had caught a snake in the act of ripping a tail off a skink. Well and good, I thought, but where’s mine? So I am walking along, seeing snake food like skinks all over the place, when Wes and Josef come down the trail towards me. We stopped, admired the snake Josef had already bagged and the photos Wes took of it eating its skink tail, all three of us turned around…Josef stooped over and grabbed our largest jita of the expedition, about a foot behind me. I must have stepped right over it a moment beforehand. Perhaps it is not necessary to tell you that there has been much snickering among the younger members of this outfit ever since… Argh. PARTNERS We gratefully acknowledge the support of the Research Investment Fund of the California Academy of Sciences, the Société de Conservation et Développement (SCD) for logistics, ground transportation and lodging, STePUP of Sao Tome http://www.stepup.st/ and especially the generosity of three private individuals, George F. Breed, Gerry F. Ohrstrom and Timothy M. Muller, for making GG III possible. More anon. Author islandbiodiversityracePosted on May 3, 2008 Categories Biodiversity, biogeography, frogs, Gulf of Guinea, principe, Sao Tome, snakesTags 1293, 1294, 1295, 7085 Comments on The Race Continues: We Find Jita! Hello, folks. The blog is now up, thanks to the gang at WildlifeDirect. These postings will be somewhat retrospective as the first team has been on the islands for nearly three weeks already. Also, internet connections are very slow here (Principe, at the moment), but I will do my best. I notice we already have a response on the forum from a woman named Theresa, but I will have to learn how to respond later. The GG III team: Perry, Wenk, Desjardin, Eckerman, Drewes, Daniel on Principe. 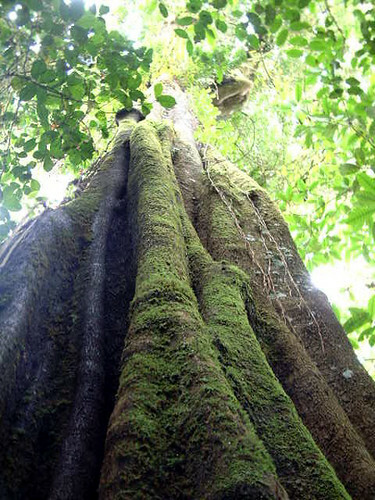 At the time of our second expedition (GG II) in 2006, there were only four species of mushrooms known from the Island of Sao Tome, and no one had ever explored the smaller, much older Principe for mushrooms (or cugumelos, as they are known here). Dennis Desjardin, a world mushroom authority was kind enough to join us for the first two weeks of GG II. At the end of his two weeks, Dennis had made 98 collections of at least 80 species of perhaps 40 genera of mushrooms, all from Sao Tome! Needless to say, I was delighted to find this unanticipated level of diversity! Now, imagine how I felt two weeks later when, sitting in the steamy internet bar in Sao Tome, I read an email message from Dennis telling me that his luggage (and the mushrooms) had first been lost in Lisbon, and then later misdirected to the US through Newark, NJ instead of San Francisco where our institution is located. In Newark an agricultural/customs officer pulled the specimens out and promptly destroyed them (in spite of the permits, conspicuous labels, etc. on all of the packages). A devastating loss. I told this story in a public lecture a year ago, and thanks to the generosity of three private individuals in the audience, a grant from CAS and support from SCD we are back! Part of our mission has been to recoup our mushroom losses from Sao Tome and to conduct the first survey of cugumelos on Principe. 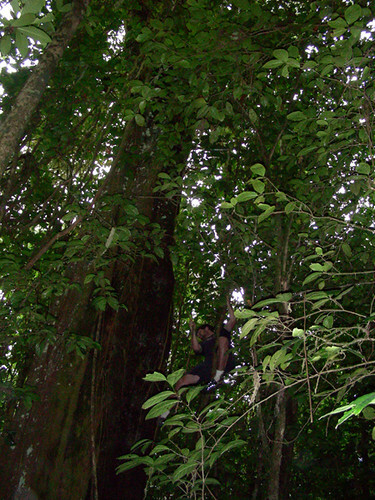 At time of writing, the whole team has walked up and down mountainous jungle trails from sea level to 1280 meters on Sao Tome, and with logistic support we did not have during GG I (2001) and GG II we have explored every accessible habitat type on Principe, once by boat. Turns out mushrooms grow in a lot of different habitats including not far from the high tide line on beaches. Dennis and Brian tell me that the overall count of mushroom species so far, including both islands, is 220! We have 75 carefully dried and preserved specimens from Principe alone- this will be the first list ever. The number 220 includes some 30 species collected during GG II but not yet recollected during GG III. Every time I get really excited, Dennis and Brian are quick to say, “ Bob, this is only a snapshot in time! A couple of months from now, there may be a whole different group of cugumelos here.” It is way to early to tell what half of this stuff is, but Brian and Dennis were particularly excited about four mushrooms that were not expected in the Gulf of Guinea at all – these are ectomicorrhyzal (sp? ); i. e. they form associations with living plants. Stay tuned. Our botanists (Tom and Rebecca), and herpetologists (me and Josef Uyeda, who joined us last week) have our own projects as well and Wes Eckerman has been photographing everything we do, every specimen we collect. More anon.